Shelby Kline Commits to Beloit College! Great job to Shelby Kline(Hononegah High) for accepting an academic scholarship and committing to Beloit College to continue to play basketball while pursuing her education to major in Biology. Shelby has always worked hard in the off season to keep her game sharp. She is a guard that will always give you 110% in practice and games, she is known for her freaky fast speed that will stifle anyone on defense and is not afraid to drive to the basket or pull up for a 3 pointer! 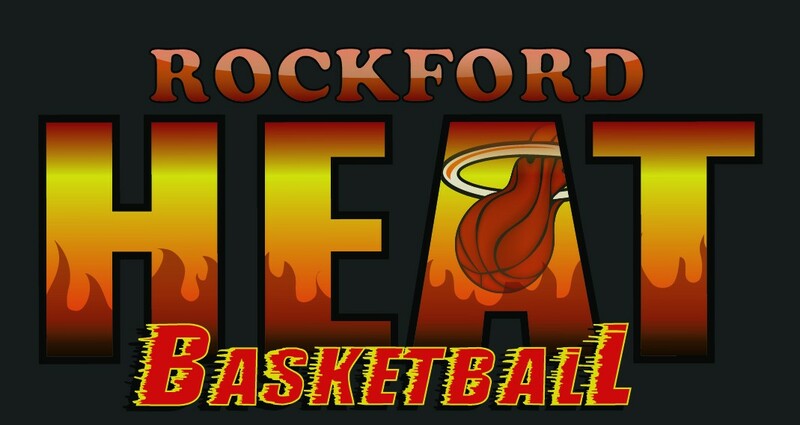 Keep up the hard work Shelby, all Rockford Heat Coaches, Parents, Players, and Fans are proud of you! Heat Varsity Elite Players Selected as USJN Pool All Stars! Shout out to a couple players that were named to the Pool F All Star Team in the USJN Mid American Challenge held in Indiana last weekend! Niaja Taylor(Auburn High), Madison Davis(Rockford Lutheran), and Ellie Welsh were selected for their play. Niaja is a guard that will get matched up with some of the toughest players to defend, she has great hands that usually results in steals, Niaja pushes the ball up the court for great transition points, she is a player that is always in the mix and has a great 3 point shot. Madison is a shooting guard that will score against anyone if her defenders give any space on the 3 points line, Madison has established herself as a pure shooter and is not afraid to mix it up under the rim for loose balls, rebounds, or putbacks. Ellie is a blue collar player that just never quits, will easily take the task of guarding literally anyone from positions 1-5, any will make out work anyone she is guarding, offensively you cannot leave her alone on the 3 point line and has not problem scoring at the rim or with a jumper. Keep up the hard work ladies! You can review the entire list at the link below. If you are a college coach, you will want to put Niaja, Madison, and Ellie on your list and get a hold of them now! Heat Varsity Select Players Chosen For USJN Pool All Stars! Shout out to a couple players that were named to the Pool I All Star Team in the USJN Mid American Challenge held in Indiana last weekend! Madi Hecox(East High) and Olivia Cattage(Rockford Lutheran) were both selected for their play. Madi is a guard that gives you everything shes got and plays on both sides of the ball, she is a taller guard that will score and play defense against anyone and has a high motor. Olivia is a power forward that will score against anyone once she gets around the rim, she is relentless around the rim on offense and defense that usually results in a lot of boards, nice form on her jumper and can shoot from anywhere on the court. Keep up the hard work ladies! You can review the entire list at the link below. If you are a college coach, you will want to put Madi and Olivia on your list and get a hold of them now! Varsity Black Team Players Selected to USJN All Star Team! Shout out to a couple players that were named to the Pool G All Star Team in the USJN Mid American Challenge held in Indiana last weekend! Taylor Hilliard(Stillman Valley) and Emily Kaempfer(Belvidere North) were both selected for their play. Emily is a guard that is a playmaker, she has a high motor on offense and defense, constantly looking to attack or dish to a team mate and is only going to get better. Taylor is a confident forward that is using post moves that compliment her size with the ability to finish with ease using her left or right hand. Keep up the hard work ladies! You can review the entire list at the link below. If you are a college coach, you will want to put Emily and Taylor on your list and get a hold of them now! Heat Sophomores Selected to USJN Pool All Star Team! Shout out to a couple players that were named to the Pool T All Star Team in the USJN Mid American Challenge held in Indiana last weekend! Erin Stroberg and Autumn Wallace were both selected for their play. Autumn is guard that is a playmaker, she has a high IQ that can penetrate any defense and finish while also utilizing a consistent 3 point shot. Erin is a confident post player that is using post moves that compliment her size with the ability to finish with ease using her left or right hand, she is only going to keep getting better and better. Keep up the hard work ladies! You can review the entire list at the link below. If you are a college coach, you will want to put Autumn and Erin on your list and get a hold of them now! Heat Freshman Selected to USJN Pool All Star Team! Shout out to a couple players that were named to the Pool Y All Star Team in the USJN Mid American Challenge held in Indiana last weekend! Maggie Bald and Georgia James were both selected for their play. Maggie is an aggressive guard that never gives up, she has a high motor and will control the tempo of the game. Georgia is a physical guard that will attack relentlessly, she will constantly be hunting down the basket when the ball is in her position. Keep up the hard work ladies! You can review the entire list at the link below. If you are a college coach, you will want to put Maggie and Georgia on your list and get a hold of them! 8th Graders Named to USJN Pool All Star Team! Shout out to a couple players that were named to the Pool All Star Team in the USJN Mid American Challenge held in Indiana last weekend! Hannah Malcombson and Olivia Lambrigtsen were both selected for their game. Hannah is known for her freaky fast speed on defense and ability to knock down the 3 ball on a regular basis. Olivia is known for her ability to guard at any position and her mid range jumper with a mix of post moves. Keep up the hard work ladies! You can review the entire list at the link below. If you are a college coach, you will want to put Hannah and Olivia on your list for the future!